Detached Legal 2 Family With A 2 Car Garage And Parking For 6 Cars On A 40 X 100 Lot. 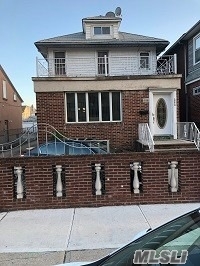 First Floor Duplex Apartment Has A Foyer, Large Living Room, Spacious Dining Room, Eat In Kitchen, 2 Bedrooms, And Bath On First Floor Along With 1 Bedroom And Bath Duplex On Second Floor. Second Floor Has A Full 1 Bedroom Apt With A Terrace. (Can Covert House To A 3 Br Apt Over A 3 Br Apt.) Full Finished Basement With A Separate Entrance Has 3 Full Rooms With Kitchen, Lr, And Bathroom. Full Stand-Up Attic.